Sleeps 10, 4 Bedrooms, 2 Bathrooms. Spectacular sea veiws close to sandy beach. Nantucket is our family holiday home, a luxurious well equipped detached house within the Pembrokeshire Coast National Park and close to the centre of the popular village of Freshwater East. Several footpaths lead through sand dunes and the nature reserve to the beautiful safe sandy beach which is about three minutes walk away. (A little bit longer coming back!) The light and airy living accommodation opens up onto the south facing terrace where you can sit back and relax on the comfortable sofas and enjoy the stunning uninterrupted sea views and the sound of waves crashing on the shore. Nantucket is our much loved family holiday home, the place we go to relax and unwind. Family Bedroom sleeps 4 in 2 single beds & a daybed that converts to a comfortable double. Cloakroom with hand wash basin & WC. Family shower room with wash hand basin, WC & shower. Utility room with sink, washing machine and tumble drier. Twin room with hand wash basin. Double room with a standard double bed & hand wash basin. Double room with kingsize bed, ensuite bath with shower over, WC & hand wash basin. All bedrooms on this floor have doors opening up onto the lower terrace and garden. Light and airy open plan kitchen, dining room and sitting room. The kitchen is well equipped with dishwasher, microwave, oven/hob, fridge/freezer, toaster and kettle. There is a music docking station, compatible with most mobile devices in the dining area. Sliding doors open onto a large sunny balcony. Steps from sitting room lead up to a cosy television area with 40inch screen, DVD player, surround sound and Playstation 2. Off street parking for three, possibly four cars. Visitors have access to the house and garden. There is a garage which is not accessible to guests. I live in Hampshire but my parents are nearby and will help you during your stay should you have any problems. Freshwater East beach is a wide, sweeping crescent of sand backed by dunes and grassy headlands. The shallow waters are popular with families, sailors, divers, fishermen and surfers. Nantucket is located within the Coastal National Park, a Nature Reserve and has direct access to the coastal path. There is a pub on your doorstep with a great view serving food and ales. We think Nantucket has all the ingredients for a great holiday! The Coastal Cruiser bus runs from the end of the road. You can leave the house on foot, follow the Coast path in either direction and get a ride back. The train station at Lamphey is 2 miles away. We can only take bookings with Saturday changeover due to our cleaners availability. If you want to book an off-peak four day break and arrive on a different day please contact me. I am an Artist/Interior Designer and was lucky enough to grow up in Pembrokeshire, it is a very special and inspirational place. I try to be there as much as life will allow, my aim is for my children to enjoy the benefits of the Pembrokeshire laid back, out door lifestyle. We are a family who love horse riding, swimming, surfing, sailing and skiing. We bought this property because we loved spectacular view, the light and airy space and the fact that you can hear the waves crashing on the beach! We have always enjoyed the beautiful, unspoilt, family friendly beach of Freshwater East with our children. There are very few places in Pembrokeshire where you can live so close to the sea so we feel very privileged to have been able to buy this fabulous house in our perfect location for family holidays. All of our favourite beaches are within a few miles of the house and there is even a pub on your doorstep. The beautiful Historic town Tenby is only a few miles away with a choice of many pubs and restaurants. The house is right on the coast path and with the coastal cruiser bus passing close by you can leave the house on foot and get the bus back. Open plan kitchen, dining room and sitting room. The kitchen is well equipped with dishwasher, microwave, oven/hob, fridge/freezer, toaster and kettle. There is a music docking station. Music docking station in the dining area is compatible with most devices. A play station 2 and games. Secluded landscaped gardens stocked with tropical plants next to nature reserve. The open plan living and dining room open onto well furnished terrace with uninterrupted sea views. The lower ground floor bedrooms all have doors opening onto a decked terrace and leafy private garden. Within Pembrokeshire Coast National Park, Freshwater East beach is a wide, sweeping crescent of sand backed by dunes and grassy headlands. The shallow waters are popular with families, sailors, divers, fishermen and surfers. Nantucket is located within the Coastal National Park, a Nature Reserve and has direct access to the coastal path. There is a pub on your doorstep with a great view serving food and ales. We think Nantucket has all the ingredients for a great holiday! Perfect house in perfect position. Everything we needed to give us the perfect break .Comfortable furnishings. Kitchen had everything we needed. Terrace well furnished and outside area tidy. Enabled us to just get on and enjoy the wonderful weather .Good communication with owner. Cleaner does a wonderful job. Thank you Elaine, We are so glad you enjoyed your stay. Fantastic property in a wonderful location. Great for larger party or 2 families. Had a wonderful stay at Nantucket with our large adult family. Great position a short hilled walk to the beach which was a great beach for paddle boarding, swimming, kayaking or just exploring with an evening walk. The property itself was a great size and we all loved the "snug" for tv/ films. The fire helped our cooler evenings too. It had everything we needed, including good Wi-Fi. Some parts of the property perhaps need a little updating : En-suite shower was amazingly too powerful, so if you wanted the heat, it couldn't be used in the holder. Perhaps the outside tap could be a shower to help with the cleaning off after outside activities? Easy access to shops, pubs and coastline. A fun filled week in a perfect location. Thanks. lovely living space with glorious views over the bay. Easy walk to the beach and good exercise returning up the hill. My family and I had a wonderful week staying at Nantucket, the house is fabulous with a lovely sea view and the nearby beach is great and not at all crowded even though it was August when we visited. We appreciated the suggestions of where to eat and particularly liked The Brewery Inn at Cosheston. Hope to visit Nantucket again one day. 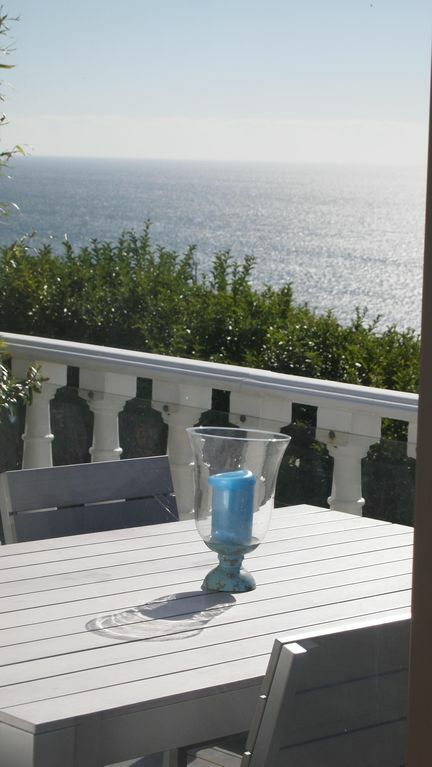 This was the perfect house location with fabulous views and an easy stroll down to the beach. Some of the party used the more challenging steep route. The house was comfortable and well equipped. The living space was good open plan layout and the bedrooms were a good size. The TV snug was perfect for Wimbledon on the only wet day. Seven golfing grannies had a super week at Nantucket. An overall very comfortable house with all the essentials you would need. Ideally located for the Pembrokeshire Coastal Path and beautiful coastal resorts nearby. The local pub (only a short walk away) served excellent fish and chips. Would definitely recommend this house and area for families too. Pets are allowed by arrangement please ask.